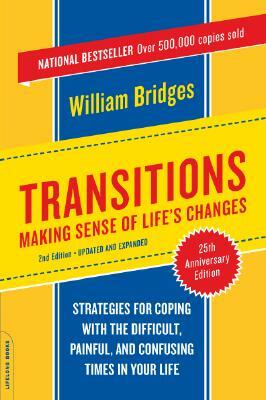 William Bridges became an expert on transitions. His tapes and books have been helpful to me. The first one I read was Transitions: Making Sense of Life's Changes. His entrance into the study and teaching was interesting: “I became interested in the subject of transition around 1970 when I was going through some difficult inner and outer changes. Although I gave up my teaching career because of those changes, I found myself teaching a seminar called, ‘Being in Transition.’” He states that change comes from the outside and is inevitable. Transition comes from the inside and is a choice. 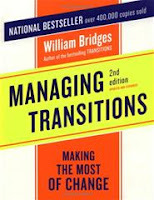 The second book I read was Managing Transitions: Making the Most of Change. The first was the process and theory of transition. This one is a handbook of how to manage change in individuals and groups. A “mustard seed” I gained from this book was the Transition Monitoring Team – a committee in the organization that keeps the leaders aware of how the group is dealing with the change. 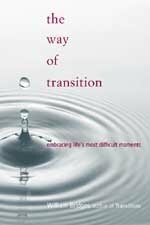 The third book, The Way of Transition: Embracing Life's Most Difficult Moments, describes how he dealt with the terminal illness of his wife, her death, his recovery, and eventual remarriage. He said there were times in this process he doubted whether anything he had been teaching was right. The pain of the “neutral zone” was great for him even though he had studied it and had been teaching the principles for years.